Details relating to the Italian Commemorative of 2010. This coin commemorates the 200th anniversary of the birth of Camillo Benso von Cavour. Cavour was one of the three main figures (the others being Garibaldi and Mazzini) who brought about the unification of Italy. Cavour was a politician or rather statesman who was the architect of the Italian constitution and was the first president of the new kingdom of Italy. He died shortly before his dream of a fully united Italy came to pass. 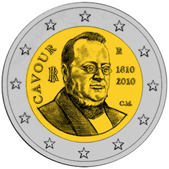 The motif for the coin is simply a portrait of Cavour looking to the right. Around the edge of the inner circle from between eight and nine o’clock to between ten and eleven o’clock is the inscription CAVOUR. To the left of the head is the country designation – an I superimposed on an R.
The mint mark is between one and two o’clock and thereunder are Cavour’s date of birth and the year of issue - 1810 2010. The initials of the designer “CM” appear at four o’clock. Return from Italian Commemorative 2010 to euro coin collector.